Feels like I empty and reload this thing 20 times a day. A task I detest. It wouldn't be such a chore if I didn't have a toddler derailing me at every turn. The second this door is open he is pulling out clean dishes and throwing them on the floor, going for the knives, trying to put his cars in, climbing in himself, attempting to yank out the whole basket, pulling out all the dirty dishes as soon as I put them in, or even stubbornly closing the door on my fingers over and over. Occupying him elsewhere just means I'll have a different mess in another place. Securing him in his high chair means wailing. 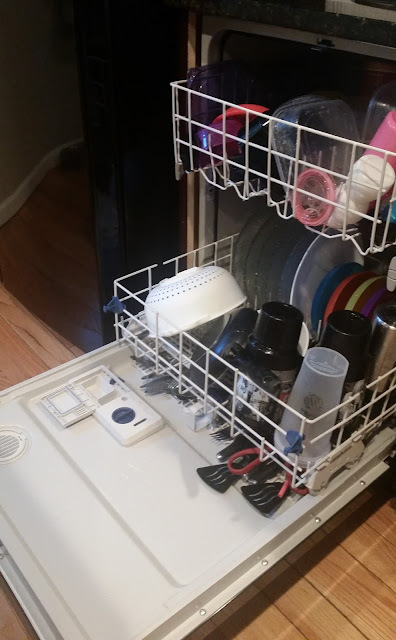 So I do dishes quietly and sneakily on the sly before he even realizes it. While I am doing the dishes like a cat burglar I get so wrapped up in the inconvenience of having to do them that way that I forget all about how blessed I am. What a blessing to have a healthy, active son who, despite his Dennis the Mennace tendencies, is so adorably affectionate and loving. What a blessing to have a family to cook for, food to feed them, dishes to use, a new dishwasher to wash the dishes, and the privilege of staying home with the kids and the dishes instead of having to come home to them all after a long day of working elsewhere. I often find myself complaining rather than celebrating. I don't always remember to look for blessings instead of trials. But when I do I am a much more joyful steward. I am thankful that God speaks change into my heart and gently reminds me that I can glorify Him even in the smallest, most insignificant details of my day. But, if you come to my house and see a sink piled high with dishes, you'll know why. House work with kids underfoot. Sigh/smile.